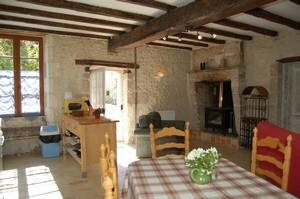 Description of Property: Many original features including exposed stones and beamed ceilings. Refurbished in 2006. It offers a large living area with a fully equiped kitchen , sitting room corner with satellite TV, wood burner and gas central heating, 2 sofas, 1 double bedroom, bathroom/toilet (tub), storage room and laundry/boiler room. 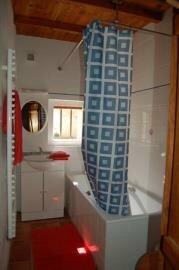 Upstairs a twin bedroom with en suite bathroom/toilet (cubicle shower). Private and enclosed courtyard at rear. Walking distance from the very sought after village of Aubeterre sur Dronne (one of the prettiest villages in France). Beautiful sceneries. Set on 25 acres of private land. Ideal base for house hunters or holiday makers. Note the price does not include water, electricity, gas, broadband or telephone. Outside Amenities: Small private and enclosed courtyard with garden furniture, BBQ. Open views. Surrounding Area: Walking distance to one of the prettiest villages in France, the river beach, cycling and pedestrian paths. Within easy reach of historical market towns such as Chalais, Ribérac, Villebois Lavalette, Montmoreau. 60km from St Emilion and the vinyards. 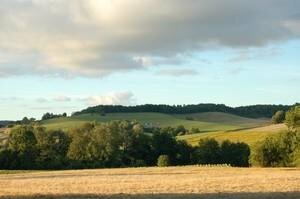 80km from Cognac and its well known distilleries. 1h from Périgueux, the capital of the Perigord. 1h30 from the Atlantic Coast. Mains water. Private water. Mains drainage. Electricity. Telephone. Broadband Internet Access. Television. Satellite TV. DVD. Price payable by direct debit. 400€ deposit required, returnable within 10 days of leaving. If we are unavailable when calling please leave a message.